Scramble golf events are often more fun and faster than regular stroke-play events. 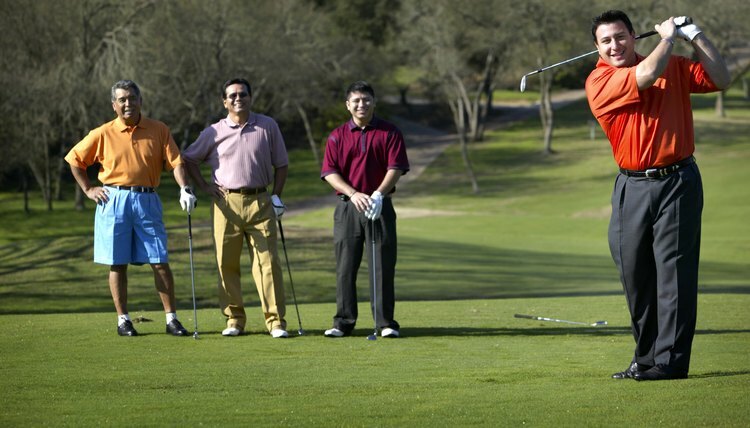 A four-person golf scramble is a format often used in friendly competition. People organizing casual golf tournaments as part of a fund-raising effort may favor the scramble because it allows players of all abilities to participate. The rules are simple: Each player in the four-person scramble hits a drive. The team chooses the best drive and selects that position for the next shot. Each player hits from the chosen spot, and the process continues until someone from the team sinks a putt. The group records its score for the hole and moves on to the next teeing ground. It's a fun format, especially for people who aren't skilled golfers but want to participate in the event. Form a committee if you're planning a large event. Putting on a scramble is a lot of work for one person. Get helpers who can assist with accounting, securing prizes, publicity, recruiting participants and serving as a point of contact with the golf course. Choose a golf course. Virtually all public courses are happy to host four-person scramble golf tournaments; contact several for price quotes. Contact the courses after you determine how many golfers you expect to participate. Negotiate a contract with the facility of your choice. For a large group, the course may request a deposit for the golf, along with a deposit for other requests, such as a luncheon after the event. Advertise your event months in advance if you're planning for a large field. Post messages on social networking and professional networking sites, where appropriate. Also leverage other networking opportunities, such as notices on bulletin boards at grocery stores and coffee shops. Distribute four-person scramble rules to each participant as the event is about to begin. Usually the rules are placed in each participant's cart. Review the rules orally with the group to make sure everyone understands the format. Start the tournament by having each foursome drive to an assigned hole if the course has arranged a so-called "shotgun" start for large groups. Or play according to tee times if the scramble has a smaller field. Compare scores at the end of the competition to determine the winners. Robert Lee has been an entrepreneur and writer with a background in starting small businesses since 1974. He has written for various websites and for several daily and community newspapers on a wide variety of topics, including business, the Internet economy and more. He studied English in college and earned a Bachelor of Arts in liberal arts from Governor's State University. What Does it Mean to Play Golf Chicago Style? How Is Handicap Used in Golf? What Is a Golf Skins Tournament?